Flexible and Durable Yet Ultra Lightweight. Can Expand Quickly To 50 feet In The Water Filling Process. Automatically Recovers To Original Shrinkable Length When the Water is Shut Off - Will Not Twist, Tangle Or Kink - Great For Many Watering and Cleaning Uses. Quickly Expands To 3 Times Its Original Size When Water is Turned On Fully Retracts To The Original Length When Water is Off Light Weight and Portable Size, Convenient To Carry, Use and Store Equipped With A Spray Nozzle. Made Of High Quality Abs Plastic Covered With Polyester Fabric To Protect The Inner Tube Ergonomic Handle Of The Spray Nozzle, Comfortable To Use 7 Adjustable Modes, Including Flat, Center, Cone, Full, Mist, Jet, Shower Multi Uses In Daily Life, Such As Gardening, Car Washing, House Cleaning, Not Easy To Tangle, Twist Or Kink. 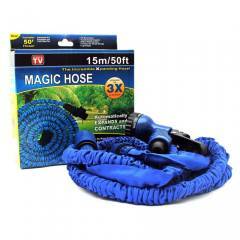 Cierie 15m Magic Hose Pipe is a premium quality Pipes from Cierie. Moglix is a well-known ecommerce platform for qualitative range of Pipes. All Cierie 15m Magic Hose Pipe are manufactured by using quality assured material and advanced techniques, which make them up to the standard in this highly challenging field. The materials utilized to manufacture Cierie 15m Magic Hose Pipe, are sourced from the most reliable and official Pipes vendors, chosen after performing detailed market surveys. Thus, Cierie products are widely acknowledged in the market for their high quality. We are dedicatedly involved in providing an excellent quality array of Cierie Pipes.